If you're looking for a small but mighty addition to your home, both the Shih Tzu and Yorkshire Terrier breeds fit the bill. Both dogs shed very little and have hair rather than fur, making them less likely to trigger pet allergies than other breeds. With similar personalities and equally adorable little faces, it's difficult to choose between the two breeds in a Shih Tzu vs. Yorkie debate. Fortunately, you don't have to. If you're feeling torn, consider getting a Shorkie. As a Shih Tzu Yorkie mix, a Shorkie lets you enjoy both breeds at once. Feisty and opinionated, Shorkies don't always lend themselves well to apartment living. These little dogs like to bark and may disturb your neighbors if you live in an apartment featuring thin walls and close quarters. It's also best to avoid a Shorkie if you have small children in your home. This breed isn't always patient with little ones. They are, however, irresistibly cute, which often leads to small children picking them up and carrying them around like a living teddy bear. Because they are so small and have fairly delicate bones, children often unintentionally hurt Shorkies and other toy breeds when loving on them in this way. Like many other toy breeds, Shorkies love a good snuggle. Bred as companion dogs, a Shorkie puppy will crave time with you and your family members. Without it, she will become agitated and may develop separation anxiety. Make sure you have enough time to lavish affection on a Shorkie frequently. Like all puppies, Shorkies need proper puppy food to ensure they get all the nutrition they need to grow up strong and healthy. How much you feed depends on the size of the dog. A healthy adult Shorkie eats about 40 calories a day per pound of body weight. Weighing in at about eight pounds, most adults will consume 320 calories per day (eight pounds multiplied by 40 calories). Start by giving your puppy the same amount of calories by breaking his daily intake into four small meals. When he reaches four months, drop to three feedings a day. At six months, start feeding your puppy twice a day. At around 12 months, slowly transition him to adult food and feed him twice a day. Proper feeding is an important part of Shorkie care. This feeding schedule is a good place to start, but remember that all dogs are unique individuals with different metabolisms. The dog's body condition ultimately determines how much you should feed her. When a dog is healthy, she should taper a bit at the waist, and you should be able to feel her ribs easily when you run your hands over her body. If you can see her hip bones or ribs, feed her a bit more. If she doesn't taper at the waist and you can't feel her ribs at all, feed her a little less. Like most puppies, young Shorkies have energy to spare. Your puppy will calm down as she gets older, but Shorkies require 30 to 60 minutes of exercise a day. Small but determined, your Shorkie will keep up with you on walks and tolerate longer hikes and exercise sessions periodically. These dogs have a stubborn streak, however, so they prefer to exercise on their own timeline rather than yours. It may take some treats or other motivation to get your pet moving, but once he gets going, he'll keep on trucking. A Yorkie Shih Tzu mix is likely to inherit a stubborn streak from both of his parents. Shorkies want to be with you all the time, but they don't necessarily care if they're pleasing you while they're there. This makes training a bit tricky in spite of the breed's high level of intelligence. Shorkies generally respond well to clicker training and do best when training starts early. Difficult to housebreak, your Shorkie will need consistent trips to the potty every morning upon waking, after each meal, and before play sessions. Expect your young puppy to need a trip to the toilet as often as every 30 minutes when you first begin training. To avoid matting, Shorkies need to be brushed at least once a week, although daily brushing is preferable. To minimize this maintenance, many Shorkie owners visit the groomer every six to eight weeks and ask for the teddy bear treatment. 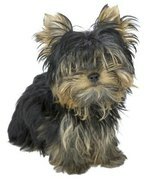 This style means short fur on the animal's body but just a trim around the face, which remains long and bushy. The result is a dog with a sleek body and a face reminiscent of Chewbacca. This type of cut reduces body matting and helps keep face fur trimmed so food doesn't get caught in it. Unless your pup gets into something he shouldn't, a monthly bath should suffice.